All charities are different and therefore no two trustee boards can be expected to share similar competences among their members. The skills needed to run a local charity with income of under £20,000 a year and no staff are completely different to those needed to run, say, Oxfam or Scope. However, although the scale and complexity of the role might change significantly depending on the size, stability and profile of the charity, there is surprising commonality around some of the key competences that all trustees need to exhibit. I would also argue that the state of the organisation can put the spotlight on certain competences more than others, but let’s start by looking at the bits that most trustee roles have in common. There are subtle differences between working on an exec board (either as a director of a charity or indeed in the corporate sector) and on a trustee board. As a trustee you’re there to collectively hold the mission and vision of the organisation and keep it true to its charity objects. You’re also there as a regulator to ensure that the charity manages its resources appropriately, legally and conscientiously. You’re there to advise and support the exec team and to utilise your influence externally to help promote the organisation’s work. With the spotlight on the sector from the press over the past couple of years, the regulatory role has been firmly in the spotlight. However this is a disservice to the much wider and more important role of the trustee board in shaping and nurturing the organisation towards its mission. Regulation mustn’t be overlooked nor overplayed. The second area of focus for many boards once they’re satisfied that a potential trustee can fulfil the regulatory role is to look for a lawyer and an accountant on the board. Again, these are useful skills to have and fall under the ‘professional and technical expertise’ category below – but these are again just a part of the overall picture. I don’t have the time and you probably don’t have the patience to examine each of these in detail now, although if you’d like to know more please do get in touch. However let me make a few observations on some of these. Many boards are actively looking for trustees with skills in fundraising. This misses the point. Charities need to look much more broadly at their potential for income generation – a much wider concept than simply fundraising. Releasing the inherent value of your intellectual property, for instance, licencing your brand to generate income, setting up a trading company as a social enterprise to generate profits for your charity. Your fundraisers should be able to fundraise – but the trustees can add a new dimension to the exec team’s thinking by addressing the broader issues. It’s essential that you understand your trustees’ motivations for getting involved so that you know how best to utilise their skills and availability. I often start by thinking about the candidate’s heart, head or ego motivation. If it’s from the heart it will be because they have a strong personal affinity with the cause or the founder of the charity. They’re likely to have a strong commitment and be prepared to do whatever to keep the charity going – although this can sometimes blind their judgement. If it’s a head motivation it’s something to do with the technical challenge presented, or career development opportunity that being a trustee might give them. 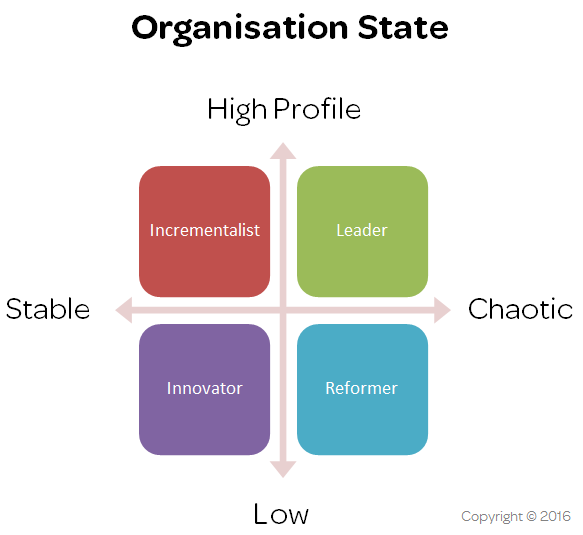 These people are likely to be more interested in the task rather than the mission and ensuring their values match those of the organisation is key. Finally, the ego motivation is for those trustees who love the status and recognition that comes from participation. These people can be a huge asset to the Board, often with well connected, powerful and wealthy friends – but they may not have the first clue as to how to function well on a Trustee board. This might indeed be legal or financial skills or, indeed, digital or social media skills. But don’t assume having an expert on the Board in any of these areas is likely to solve any of your problems on its own. They’re most likely able to signpost you in the direction of the help you need rather than provide it themselves. Having ensured you’ve covered your bases with the key competences, you can still find your Trustee board falling to pieces, especially when the pressure is on. Below I’ve suggested four dominant personality attributes that the Trustee board will need to demonstrate depending on the state of the organisation measured against – its public profile and degree of stability. Stable, high profile charities are usually long established and much loved, with a national or international mandate and a high degree of trust with the general public. They often attract ‘ego’ trustees wanting status and recognition for their contribution. They can be complex and sometimes bureaucratic organisations with substantial management teams, often also dependant on government and /or local authority funding. Change needs to be managed slowly and carefully in this kind of organisation – to ensure there’s no strategic drift, improve its efficiency and effectiveness but not to lose its distinctive appeal. Hence the incrementalist. By contrast, organisations that have a high profile yet are chaotic and badly run need to bring out a very different set of skills from their trustee board, who might be tempted to otherwise dig out their invisibility cloaks. Kids Company is the obvious reference point here. Leadership skills are essential as is experience in crisis management. Many Trustees would be keen to steer clear of organisations in the public eye that are in disarray but the ones caught in the spotlight need to have the skills to lead the organisation through the storm. Trustees who succeed in situations like this are firstly likely to have a strong and experienced Chair, and are likely to have worked in complex organisations having successfully led change management programmes. Similarly, chaotic organisations with a low profile also need to be handled with care. A typical example might be where they are still led by the founder, fundraising with passion on a particular cause but finding it hard to work in partnership or to grow the organisation due to competition for funds and an inability to let go. Or an organisation that’s suffered strategic drift and pulled in different directions by an antagonistic membership. Trustees need to be able to reform the organisation, it’s leadership and it’s mission if its going to succeed. There’s likely to be a significant time commitment involved for the trustees to sort out the organisation and little tolerance for Board members not seen to be pulling their weight. External relations skills are critical as are judThe IncrementalistLeaderReformerInnovatorgement and strategic planning. Finally, organisations that have a low profile and are in a steady state with secure funding or a strong capital base are in some cases, a trustee’s dream. Sometimes these organisations that are quasi-charities: a strong trading arm providing the main revenue for an organisation delivering social benefit and registered as a charity, or a local charity with a committed benefactor or healthy endowment. However, the key is to ensure the charity is not going backwards and look for innovation in service delivery and meeting beneficiary needs. The trustees need to have a healthy and up to date approach to risk management and use their strong financial base to think creatively and innovatively to see how beneficiaries could be even better served. Organisations can of course move between these boxes and so the competencies demonstrated by the trustees will change over time. The extent to which trustees work well as a board and as a team is a topic for another day but needless to say, ensuring your trustees have the core competences for your organisation in its current state is a good place to start.